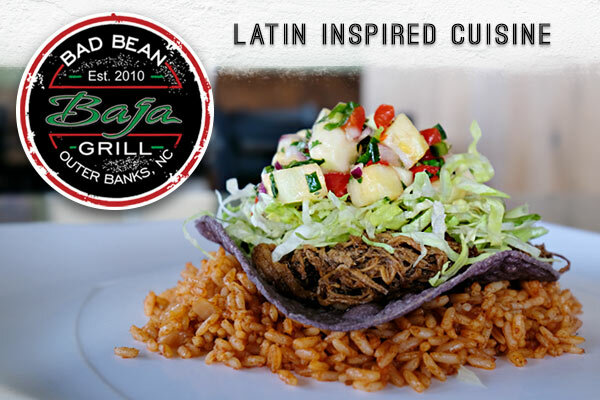 Bad Bean Baja Grill is a locals’ favorite when it comes to fresh, creative and delicious Mexican cuisine on the Outer Banks. This chef-driven restaurant isn’t a typical Mexican joint among Kitty Hawk restaurants. Bad Bean Baja Grill's tacos, quesadillas, burritos and more burst with the freshest of ingredients in meals where Mexican and Latin-American cuisine are fused with Coastal Carolina, Baja California, Tex-Mex and Asian influences. At Bad Bean the Caesar salad has its own twist, and meals like the Mushroom and Goat Cheese Quesadillas feel both filling and guilt free. Even the hungriest diners can count on the half-pound, tortilla-wrapped Baja Burger to fill hollow legs. The Kitty Hawk restaurant maintains a loyal following of foodies, but there’s nothing pretentious about the dishes or the vibe. Local favorites include the fish tacos and pork belly tacos, both made with seasonal, local ingredients. In fact, everything in Bad Bean is fresh and made in the kitchen, from their various salsas to their corn chips in addition to the sauces, marinades and seasonings in your dishes. No matter how many times you visit, there’s constantly a new dish or drink to try. Bad Bean always has new daily specials, so even if you feel like you’ve tasted it all, the ever-changing food and drink additions keep your palate fresh. The same goes for their bar, where their craft beers on tap rotate regularly, and a different margarita special is featured almost each day. That said, however, there’s a reason why pints of the mixers for their house margaritas and Bloody Marys are available for customers to purchase and take home. The friendly staff makes everyone feel welcomed and at ease, from big families to last-minute diners to folks just looking for a taco fix on their way home after a day on the beach. Slide into a booth or pull up a chair at the bar. Admire the local artwork on the walls and relax – Bad Bean Baja Grill keeps it exciting and fun in their laid-back setting.